Growing rampantly Creeping Pink Thyme is more suitable as a ground cover than a filler for between pavers. Flowers are prolific and will reach a height of two to three inches. These can be sheared with a weed eater or mower set on high when the show is over. The thyme itself stays fairly flat. The almost succulent like leaves and the abundance of little hairs on Creeping Pink Thyme contribute to its ability to withstand heat and use less water. 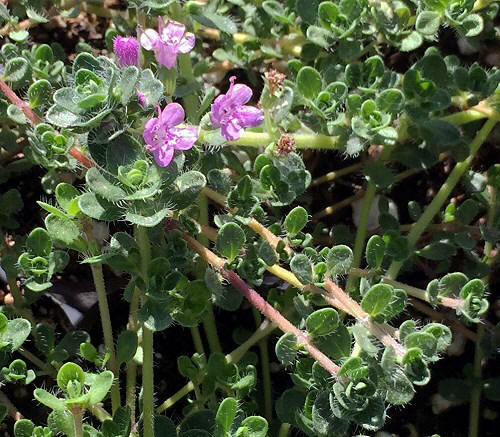 Creeping Pink Thyme is often included in our 36 Pack Alternative Lawn Assortments. This plant is often available in plug trays. These trays hold 128 of all the same plant. They are a great low cost way to fill a lot of space. Each cell is 3/4 of inch by an inch. Check here to see if Creeping Pink Thyme Plug Trays are available.